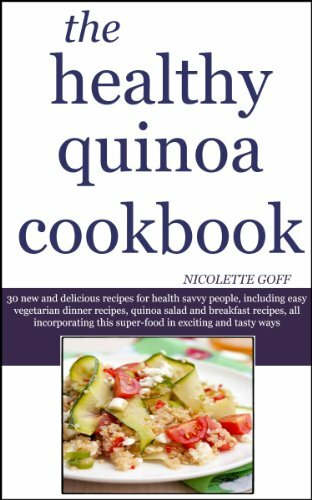 From the author of Easy Quinoa Recipes: 30 new and delicious recipes for health savvy people, including easy vegetarian dinner recipes, quinoa salads and breakfast recipes. The recipes incorporate this perfect protein super-food in exciting and tasty ways by melding it with healthy vegetables, fruits and meats. For breakfast,enjoy the Oat Bran Quinoa pancakes or follow the directions to make your own Quinoa Granola. For lunch or dinner, go Mediterranean with the Greek Inspired Quinoa Salad, or Mexican with her inspired Taco Quinoa Casserole. Even desserts are included, from Quinoa Maple Date Pudding to gluten-free ginger cookies.